“We do have excess office space that we contracted for back in 2013 and an earlier time frame when obviously commodity prices were higher and we were expanding at a faster pace,” says Harris. The company, which has occupancy in six downtown Calgary buildings, declined to give a breakdown of sublease space on the market by building. It also would not publicly state how much space it occupies today in downtown Calgary. However, industry sources say Cenovus has about two million square feet of leased office space. 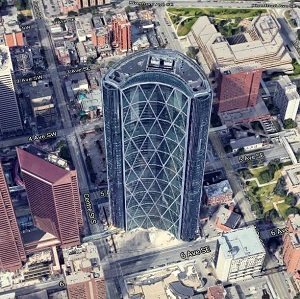 Of the space currently on the sublease market, about 178,707 square feet of that is in the Suncor Energy Centre and about 325,000 square feet is in the iconic Bow Tower (which is owned by H&R REIT). The company recently announced it is cutting 15 per cent of its workforce, believed to be between 500 to 700 staff. In a recent announcement, Cenovus said it has significantly reduced its cost structure since the downturn in oil prices began more than three years ago and it remains focused on driving costs even lower across its operations. “Cenovus remains focused on reducing its real estate costs through an active subleasing program and is not renewing existing leases as they expire,” said the energy giant. “The company continues to advance its plan to reduce the number of buildings occupied by its Calgary staff. Michael Gigliuk, vice-president, associate, with Newmark Knight Frank Devencore, says Cenovus is rivalling but still second to Petro Canada in the early 1990s in terms of the total amount of sublease space on the market at any given time. “Petro Canada had five to six fully vacant buildings and space at their existing location – at the time Petro Canada Centre – that they were subleasing . . . which totalled well over a million square feet,” says Gigliuk. “Much more so than in any previous downturn, oil and gas very likely isn’t going to come back to its previous prominence in downtown Calgary. I’m seeing more consensus/resolve on the need to diversify the tenancies in the downtown core, essentially a newly rebranded new economy, youthful, hip, high energy identity for the city.